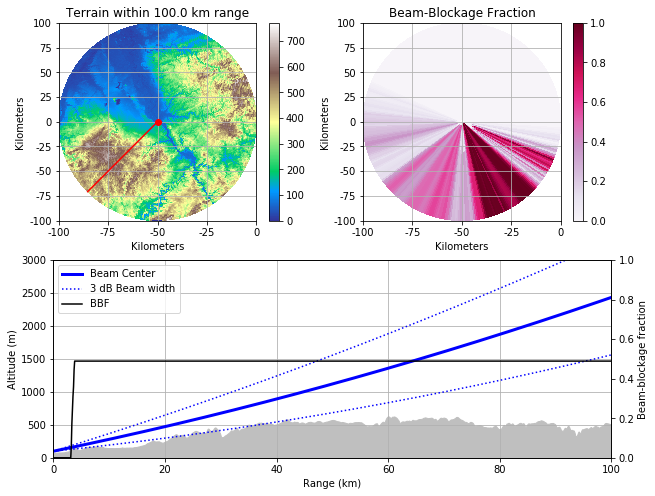 Here, we derive (partial) beam-blockage (PBB) from a Digital Elevation Model (DEM). We require - the local radar setup (sitecoords, number of rays, number of bins, antenna elevation, beamwidth, and the range resolution); - a DEM with a adequate resolution. Here we use pre-processed data from the GTOPO30 and SRTM missions. First, we need to define some radar specifications (here: University of Bonn). 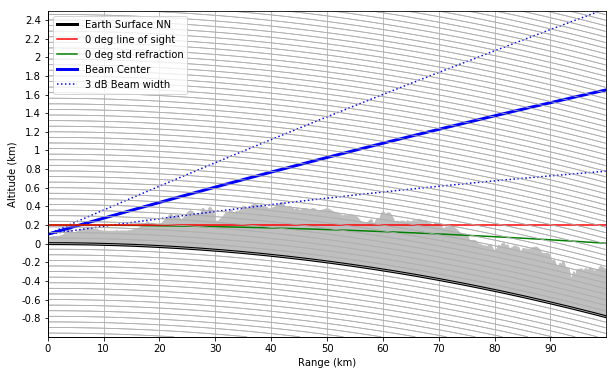 Create the range, azimuth, and beamradius arrays. to calculate the spherical coordinates of the bin centroids and their longitude, latitude and altitude. map the DEM values to the polar grid points. Note: You can choose between the coarser resolution bonn_gtopo.tif (from GTOPO30) and the finer resolution bonn_new.tif (from the SRTM mission). The DEM raster data is opened via wradlib.io.open_raster and extracted via wradlib.georef.extract_raster_dataset. Now we can finally apply the wradlib.qual.beam_block_frac function to calculate the PBB. So far, we calculated the fraction of beam blockage for each bin. In this representation the earth curvature is shown. For this we assume the earth a sphere with exactly 6370000 m radius. This is needed to get the height ticks at nice position. x = x / 1000. The wradlib.vis.create_cg-function is facilitated to create the curved geometries. The actual data is plottet as (theta, range) on the parasite axis. Some tweaking is needed to get the final plot look nice. Go back to Read DEM Raster Data, change the rasterfile to use the other resolution DEM and process again.